Traditional Victorian Organic Plum Pudding made now for next Christmas. Recipe includes gluten-free version. The roots of the plum pudding go back into the mists of time to a Celtic end-of-year celebration dish called 'plum porridge'. Like many such dishes the exact ingredients were handed down verbally but it was essentially a mix of beef and/or veal, dried fruits (in particular prunes), oats, spices and alcohol. It was furthermore, a way of preserving and providing meat over the harsh Winter. 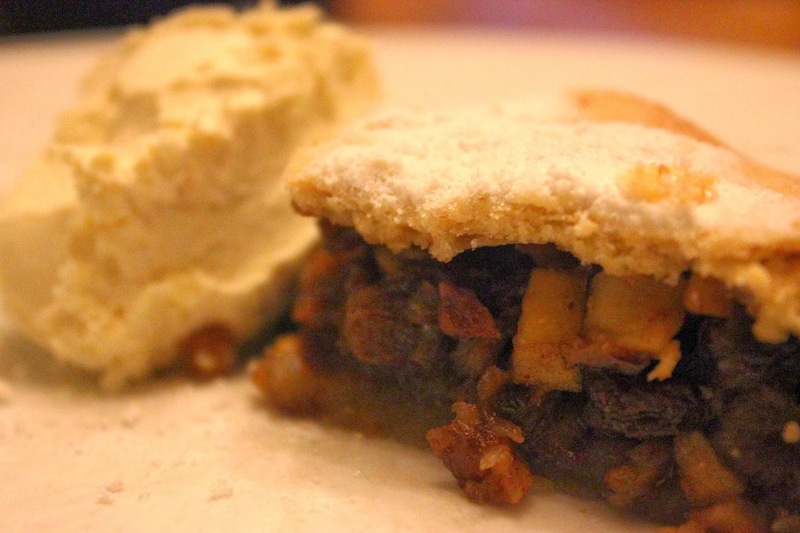 At some point in its history, this dish became enclosed in a pastry case, which made it even easier to preserve and led the way forward to another Christmas delicacy, the Mince-Pie or Mincemeat tart. At some time in the 18th century the steamed plum pudding, which was of similar ingredients to the porridge, began to be served alongside it at the Christmas celebration. However, by the Victorian Era, the plum pudding we have come to know and love today, had completely taken over the festive board. These rich porridge, pastry and pudding dishes had great economic and social significance and were, with the boar's head, the centrepiece of elaborate feasts hosted by landlords to their tenants to see them over the 'hungry gap'. This period was the old Christmastide before the Protestant work ethic took hold and it stretched between the Winter Solstice and the Feast of Lights or Candlemas on the 2nd of February. The peasant farmer's stores would be dwindling, with most of his available food shared between his family and whatever remained of his livestock. The hymn 'Good King Wencelaus' would have resonated with the Victorian churchgoer, harking back to the Feast of Fools, a day which turned feudal hierarchies upside down. Cutting the Twelfth Night Cake or Galette de Rois, when a king and queen are chosen from the amongst guests, still remains today. The older significance presides in the British Army, where at Christmastime, the officers wait upon the men. The necessity to preserve meat and the rural workforce, has given us a rich pudding which will keep and mature for a whole year. I make my puddings a year in advance and am just about to make a new batch, one for the eve of Candlemas, which just happens to be Andy's Birthday and the rest for the coming Christmas. In December 2013 I also made a gluten-free one (pictured right) for my family. 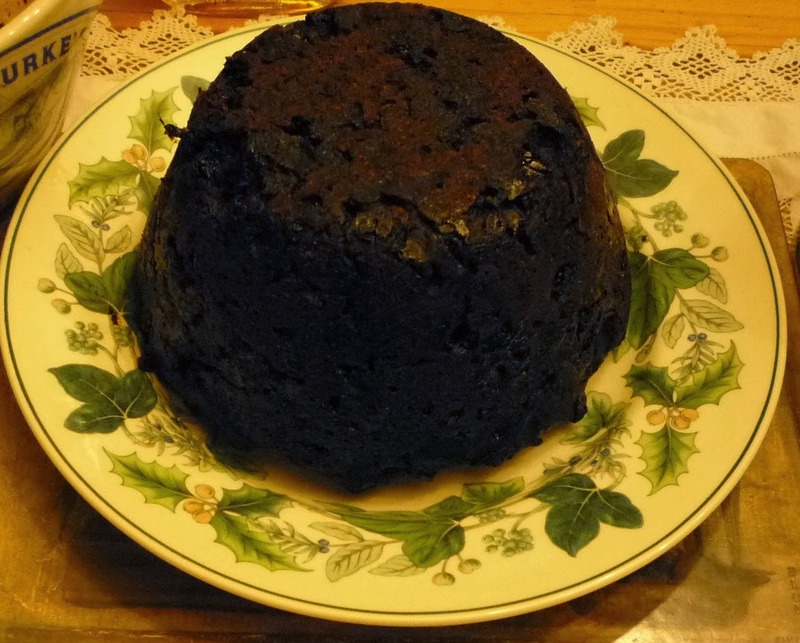 'John Bull's Own' is a plum pudding recipe from the 1861 version of Mrs. Beeton's Household Management, I've made a few adjustments, in particular in my choice of dried fruits and the amount of sugar I use. If you are unaware of Isabella Beeton, she was and is the doyenne of English Cookery. In her short life she managed to produce a body of work which covered everything from how to find a wet nurse and cook artichokes to how to cure pip in poultry and set a broken leg. This was published in 1861 in her famous 'Book of Household Management', which was and for all I know, still is a favourite wedding gift. The last on one we gave as a present, was this first edition but presented on a cd-rom. The recipes in this book, made as they are from basic seasonal foodstuffs, are excellent for organic produce. The following ingredients were meant to make one huge round pudding which, in 1861, was to be steamed in a buttered and floured cloth hanging over a pan of water. However, I always divide the mixture into three to four various sized china puddings basins. I have also put the gluten-free alternatives below and please note there was no taste of coconut in the latter pudding. 4lbs/1800g dried fruit (I use sultanas, prunes, figs, apricots, dates, candied peel (home-made see ) cherries (this year I used cranberries) plus hazelnuts and almonds. ½ lb/225g plain flour - or for gluten-free use ground almonds. ½ lb/225g bread-crumbs (we make a brioche) - or for gluten-free I use desiccated coconut with 1oz/28g white rice flour to make up the weight. 1 teaspoon of mixed spice ('mixed spice' is a traditional British pie, pudding, biscuit and cake blend, made from, ground coriander, cassia, ginger, nutmeg, caraway and cloves). ¼ pint/140ml of brandy ( I can get organic cognac here in France but last year I tried organic Calvados -- superb!). The fruit and nuts can be macerated in the spirit for several hours or even overnight. This will plump up the dried fruit and also help to mix the brandy more evenly throughout the pudding. Note the amazing shape of the organic Calvados bottle, it also comes in the form of a sailing ship! The ingredients are then mixed in the following order; flour, spice, sugar, fruit, bread-crumbs, butter, eggs. Then Mrs. Beeton, who probably had in mind a beefy-armed cook to do this work, suggests the mixture should be stirred "for 25 minutes". However as part of the mystique of the pudding is involved with making a wish whilst stirring, you can perhaps get as many of your guests, neighbours or whoever, to help you with this task! You are now ready to butter the basins and cut and butter the papers, these should be shaped so as to allow enough room to make a pleat in the paper to allow the mixture to rise. Fill the moulds, again leaving enough space to allow for expansion. You will need a volume of 5¼ pints in total if you make the whole amount. Make three 'lids' for each bowl out of the buttered paper and tie each with string or twine. On the wood cooker, I steam for between 5 to 13 hours, depending on the size. This gives a deep rich colour and fragrance and likewise an excellent depth of flavour. With the pudding I made this Christmas in Scotland, my sister used a pressure cooker. Her tip is to cook it for the first 15 minutes at atmospheric pressure, this allows the pudding to rise. As every 10 minutes in a pressure cooker is equal to half an hour in a steamer, she decided to cook our 2lb/1kl pudding at pressure for an hour, I have to say it was delicious, even if slightly lighter in colour. We serve our pudding with raw crème fraîche or sweet white sauce and brandy butter, which is made from equal parts of raw sugar and raw butter and a dash of cognac. Before bringing the pudding to, or at the table, the pudding is 'flamed' in a tablespoon of heated brandy. To accompany it, we always chose Monbazillac, a 'noble rot' wine from the left banks of the Dordogne. Kept in a cool dry place this pudding, once cooked, will be ready for this year's Christmas 2014 celebrations but as modern houses often do not have a pantry or cold store, then it is often more sensible to remove the pudding from its bowl and papers and freeze it. As part and parcel of the season of giving, the pudding was often filled with gifts, charms or small silver coins. Some of these were to tell fortunes, such as who would marry that year or make money but many were just to wish good luck. In France the Gallette des Rois contains china figures known as fèves (broad beans), this harks back to the Twelfth Night cake, which contains a dried pea and bean. Inviting friends, family and neighbours to partake of the Galette des Rois is still very popular in rural France, although the cake is more often bought than made at home. Once cut, it is passed around the guests and the ones who find the 2 fèves are pronounced king and queen of the feast and wear a gilded paper crown. Nowadays, these porcelain figures are usually representative of cartoon characters from the latest Christmas blockbuster but the older fèves are charming and highly collectable. Now if you want to, sit back and watch my animated film of the making of John Bull's Own plum pudding. All the best for this new year and enjoy your pudding at Candlemas to celebrate the end of Christmastide and if it's possible to resist, keep some for Christmas! See you next time for the ancient recipe of Kitchels or God Cakes, another delicious Winter treat to keep out the cold!